This well structured wine is deep garnet in colour, black fruit, ripe mulberries, cherries and spice on the nose. A wonderful textured mouthfeel, ending elegantly soft and silky. 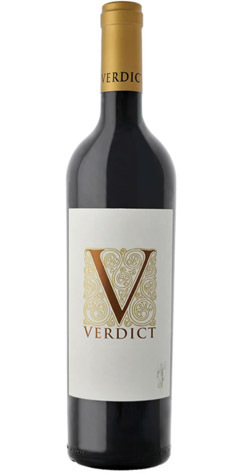 The Verdict is a Cape Blend consisting out of 31% Cabernet Sauvignon, 28% Cabernet Franc, 23% Pinotage & 18% Merlot. All varietals are harvested on La Petite Ferme and barrel matured in French oak for 12 months. Classic Cabernet pencil shavings. Cabernet Franc adds spice and herbal buchu undertones. Rich dark fruit, Black cherry, cassis. Situated on the side of the majestic Middagkrans Mountains of the magnificent Franschhoek Valley, the west-facing La Petite Ferme is one of the more intimate wineries in the Cape Winelands. More than 300 years ago, when the Huguenots arrived, they brought with them their age-old French wine and food culture. Theses amazing vineyards that cover these mountain slopes boast a valley rich in history and are centered around a picturesque village of warm and friendly people. After the revocation of the Edict of Nantes in France in 1685, when Protestantism was outlawed, hundreds of so-called Huguenots fled their homeland, 277 of them arriving by ship at the Cape of Good Hope. Many of them were given land by the Dutch government in a valley called Oliphantshoek (Elephant Corner) - so named because of the vast herds of elephants that roamed the area. Soon after they settled here, it becomes known as Franschhoek (French Corner).' Most of the wineries in Franschhoek still have their original French names and the homesteads are all Cape Dutch with gorgeous Oaks and luscious vineyards. The Dendy Youngs have been farming in Franschhoek since 1972 and in 1994 Mark and Josephine Dendy Young purchased La Petite Ferme. The wine cellar, where Mark is the resident winemaker and his father John the viticulturist, is an integral part of the food and wine experience at La Petite Ferme Restaurant. Mark's energy and passion for his wine shine through his product and seems to be a wonderful anecdote while visiting and tasting.